One quiet afternoon, a piece of “savory pork” was dangled in front of my virtual nose, of course, I followed it. To my surprise, there was a new-to-me food blog, Mrs. Wheelbarrow, and it was ready to be devoured! Cathy, suggested that I may be interested in an event she had started with the Yummy Mummy, as it is all about Charcuterie. We fell in love with really good charcuterie after meeting Kate and Dominique last April and ever since, I have been dying to get my hands dirty and learn how to make the same delicious morsels that they make. This was the subtle nudge I needed to pick up the book and start, curing, smoking, stuffing, drying and most of all having fun with an amazingly inspired group of foodies who share the same passion for this fine art of making charcuterie. My first challenge, since I missed the first official kickoff, would be the “salt cure”. I was pretty eager to start this challenge as I always have a healthy dose of pancetta stored in the freezer. It is a salty staple in our house. Great to toss into egg dishes, sauteed with potatoes, mixed with fresh spring peas; the possibilities are endless. Before starting out I had to find some good pork belly. This journey seemed endless as every time I ventured out to a market, they were out of pork belly. Was everyone in San Francisco curing pancetta? Finally, two weeks ago, we found pork belly. I followed Ruhlman’s recipe to the T, except I cut the portion in half by using only 2 1/2 pounds of belly. I have to say, I have cured bacon before and am not a big fan of the “pink salt”; but, I went ahead and followed his instructions and used it. The entire process is fairly simple, cure, overhaul (which is redistributing the seasonings every couple of days, by flipping and rubbing them into the belly), cure, overhaul, rinsing and drying. At the 7th day, the belly was no longer as squishy as ours are. It was firm and ready to be dried. I really wanted to hang the pork in our basement but was leery of critters, so I decided to dry the pancetta flat, in the refrigerator with a salty bowl of water added. After washing and drying the meat, I lightly coated the belly with some fresh cracked white pepper (I was out of black, pink and green). I did not roll the belly; instead, I wrapped it in cheesecloth and positioned it on the bottom rack of the refrigerator, with a pan under the rack to catch any of the juice. Next to the belly I put the salty bowl of water. After 3 days, I unwrapped it. It was slightly hard on the ends but still firm throughout. I was not terribly worried about the pancetta drying out any longer as pancetta is not eaten raw and I would be cooking it. There was slight, dark coloring around some of the edges, but still a bit pink, the smell was of juniper and salt; very pleasant. I fried up a little this morning and it had a mild taste, not overly salty and a little sweet. I have yet to use it in a recipe; this week. Overall, pancetta was very easy to make and cost a lot less than buying it in the stores. With a little planning, we could have fresh pancetta very often. Next time I would try to make it without the pink salt and would up the regular salt quantity; after-all, this is how Dominique would do it. If you would like to learn the fine art of “French Butchering”, there is only one place to do so; Camont. Kate and Dominique are offering hands-on courses over in beautiful Gascony. The courses range from 1 week to 6 weeks. You can decide how involved you would like to be. The hands-on workshops will allow you to follow the production of quality artisan food, from the farm to the market stall. As well you will be staying, cooking and collaborating with Kate at Camont and the Chapolards at Ferme Baradieu. We had the honor of seeing the Chapolards in action last summer. This short video will share the beauty of French Butchering. If France is too far to travel, Kate and Dominique will be traveling to various cities in the US in March – you may be able to make one their half day or one-day workshops; which, we highly recommend if you would like to get your feet wet with butchering. The experience is a great way to spend an afternoon, they both make you feel like you have come home. Recipe: You have to get the book. 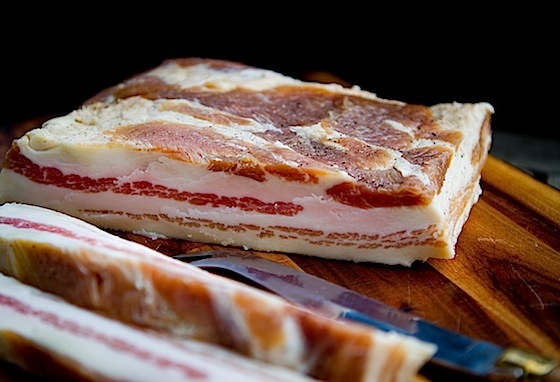 7 Responses to "Making Pancetta"
Your pancetta looks amazing :-) And you're right, with a little planning, we could also have pancetta year round - I know I could eat it every day or at least cook with it! Your pancetta looks wonderful! I really want to visit Camont for their course in Boucherie. I am so glad that you had the opportunity to go. Great post! Thanks for the shout out for the tour guys! I've been thinking about Charcuterie for a while, and I have to say your post has inspired me to take the leap. Pancetta, here I come! Thanks. That's a beautiful pancetta! Year-round sounds like a great plan! Making your own pancetta sounds like fun!